Everyone loves a refreshing slush on a hot summer day. They’re delicious and when you see that cold red and blue slush on display, it’s almost impossible to pass up buying one. Vollrath Frozen Beverage Dispensers are designed for cold or frozen slush and milk-based drinks including granitas, iced or frozen coffee or tea, frozen cocktails, smoothies, meaning these machines can serve a wide variety of tastes and preferences. These dispensers really stand out from the crowd and generate revenue, but they’re designed to meet the every day needs of your operation. The seamless bowl design eliminates the trouble that can be caused by the drink mixture getting into the motor. One of the other differences is the way the slush is mixed and chilled. The Vollrath mixing mechanism constantly runs the product over the freezing plate at the bottom of the unit. This creates a perfect slush at the coldest temperature possible with every serving. For maximum efficiency during off hours it has a night mode setting. 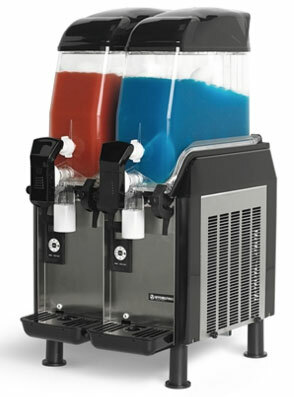 In night mode, the slush mix will hold at the proper temperature and be ready to be mixed into a refreshing slush the next morning when service starts. Controls also include low-level alert, temperature alert, and on-board diagnostics. ‘Plug and play’ installation makes it easy to add a frozen beverage program to any menu. They Vollrath Frozen Beverage Dispenser is available with a 3-gallon bowl in a single, double, and triple bowl unit. They are also available with a 1.5-gallon bowl in a single or double unit. The auto-fill accessory can be added for 3-gallon, two and three bowl machines to increase drink production.